Get Inspired to Elevate Life! Isn’t it fascinating to watch people constantly do things that seem to contradict their very natures? For example, the concept of ‘working a job’ until the day you can ‘finally‘ live your dreams when you’re too old to truly enjoy it. The reality is – the world is an abundant place, and if utilized wisely – has virtually unlimited resources for all of us to live our dreams, whatever they may be. Then repeat this daily and see what happens! 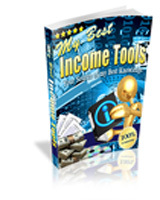 Copyright © 2009 My Best Income Tools Blog. All Rights Reserved.